I know. It’s not November. I should be writing light, Springy dessert recipes. I’m well aware it’s probably too late to be developing a recipe like this one, but I just found myself in the kitchen the other day wanting to bake something, and looked around to see what needed to be used. I had some apples with a couple spots on them, some about-to-go-stale cookies, a restless 4 year old needing an activity, and my brain just took it from there. My kids have been sick, off and on, for oh… a month?! I’m losing my mind because not only is it difficult to take care of two sick kids for the most part by yourself for a week, let alone a month, but I’ve also been a little sick too so I’m just weak and tired and tired of being weak and tired. Baking calms me, and my mother helped me understand why, out of all the months in my life, I have developed so many new recipes. I’ve been really creative so far and it’s crazy weird to me. She says it’s because I simply need something to focus on other than the craziness that’s going on around me and need something that I can control. That makes sense. I do like to control things. And mother’s are always right, right? So in honor of that notion and my mother’s birthday that was a little ruined because of my sick family, I created this recipe just for her. She always made the best Pecan Pie at Thanksgiving when I was growing up. Her Apple Pies are outstanding and the best you can find. And her Cheesecake, which is my birthday dessert, gets better and better every year she makes it. So I threw all those concepts into the blender that is my brain and this is what I came up with. It’s is a really good dessert. 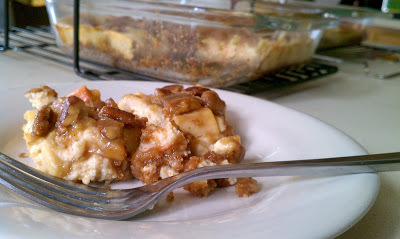 It’s Pecan Pie meets Caramel Apple Pie meets Cheesecake. I mean, come on. It can be eaten warm as you would an apple pie, room temperature as you would a pecan pie, or chilled as you would a cheesecake. It just doesn’t matter. Enjoy! And Happy Belated Birthday Mama! 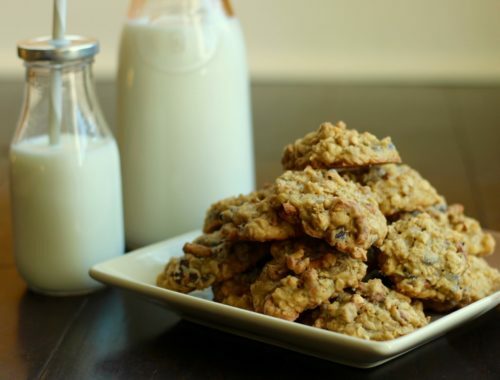 -In the bowl of the food processor add 4 ounces of ginger snaps (20 cookies), 4 ounces of cinnamon graham crackers* (7 full cracker sheets) and 1/2 tsp of kosher salt. Process until you have cookie crumbs. 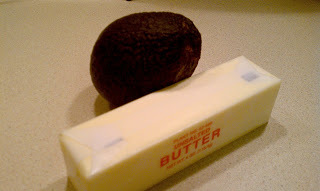 -Pour in 1 stick of unsalted butter, melted. Pulse until your crumbs are all moistened. 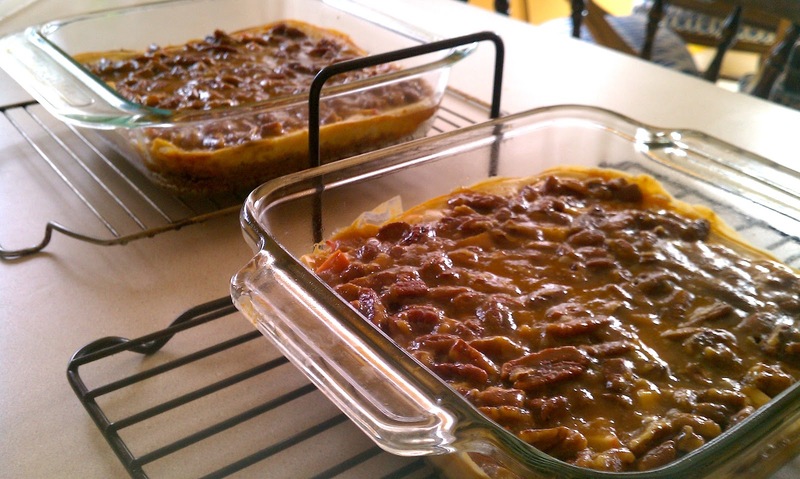 -Press into a greased 9×13 inch glass baking dish. Set aside. -In a large bowl add 8 ounces of neufchatel cream cheese, softened, 8 ounces of sour cream, 2 TB of flour, the zest of 1 lemon and 1/2 cup of sugar. With an electric beater, beat until well mixed. -Add in 3 eggs, one at a time, beating in between each one, and a splash of vanilla. Mix well until well incorporated and set aside. -In a separate, smaller mixing bowl add 2 medium apples, diced, the juice of your lemon, 1/2 tsp of cinnamon, a pinch of salt and several pinches of freshly grated nutmeg. 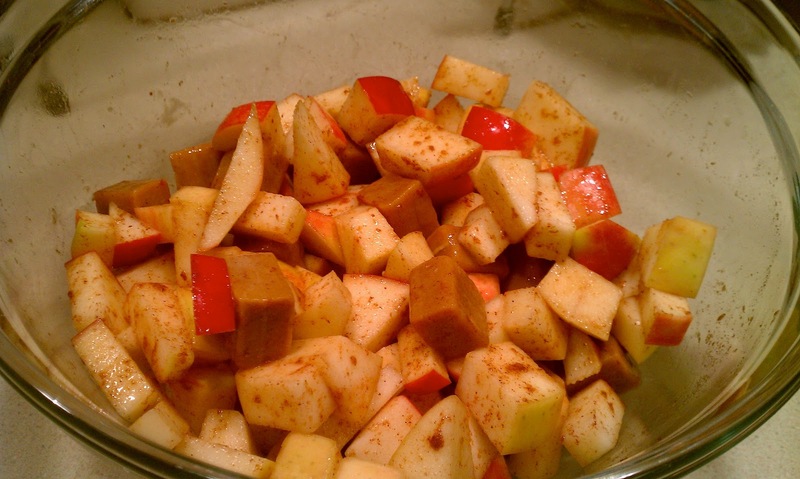 Stir to coat all the apples. -Add to this 20 caramels, cut in fourths (I used the Kraft Caramels that come in a bag, individually wrapped) and stir. -Fold this into your cheesecake mixture and pour into your prepared cookie crust. -In a large saucepan, on medium heat add 1 cup of light brown sugar, 4 TB of unsalted butter and 3/4 tsp of kosher salt. Stir to combine and allow the mixture to come to a bubble. 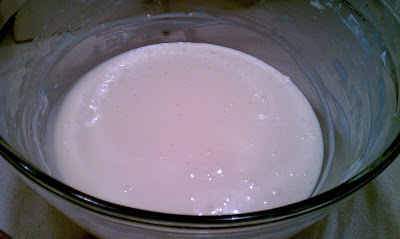 -Turn the heat down to low and add about 3 TB, or 3 good splashes, of heavy cream. It will bubble more when you do this, so don’t worry. Stir again and continue to bubble for about 3 minutes, stirring occasionally. 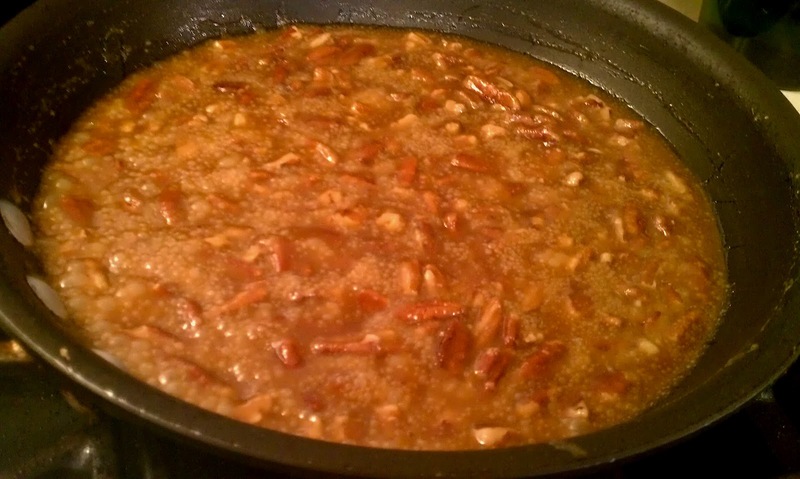 -Add in 1 cup of chopped pecans and stir well. -Keep on very low heat until your cheesecake is finished cooking. -Once your cheesecake is out of the oven, immediately pour your pecan mixture over the hot cheesecake. Do this slowly and carefully, being sure to make it as even as possible because once the hot caramel and pecan mixture hits the cheesecake, you won’t be able to spread it or move it. -Cool on a rack until no longer hot to the touch and either serve at room temperature or chilled. -Store leftovers in the refrigerator, tightly wrapped. Who cares what season it is…when the dessert sounds this good.